Following a couple of decent performances against more talented sides such as France and Denmark, Bert van Marwijk’s Australia failed against Peru. The 2-0 loss to Peruvians means Socceroos failed to keep a clean sheet for 12 consecutive World Cup games. But, above all, Australia confirmed their lack of offensive power by failing to score from open play in this FIFA World Cup 2018. Against Peru, forward Tomi Juric barely received good ball into the box and the insertion of both Tim Cahill and Daniel Arzani didn’t improve things. So, under van Marwijk, Australia was unable to get past the group stage for the third consecutive World Cup. The Dutchman took the job just some months before the start of the tournament, replacing Ange Postecoglou, the man who led them to Russia. The Dutchman totally changed the team’s tactical approach as he cut the offensive attitude instilled by his predecessor, building a side more defensively structured with the goal to be dangerous on the counter. Following this pragmatic approach, against Peru van Marwijk confirmed his cautious 4-2-3-1, with the main focus to target Juric or right winger Matthew Leckie through long balls. This tactic forced Peru’s backline to drop a bit deeper than usual. Trying to avoid Leckie and Robbie Kruse’s run at its back. Unfortunately for Socceroos, Kruse’s play has been ineffective once more whilst Mile Jedinak and Aaron Mooy provided some coverage in front of the defence but rarely offered something with Australia in possession. At the end of the day Tom Rogic, operating through the halfspaces, showed more than the other offensive players. 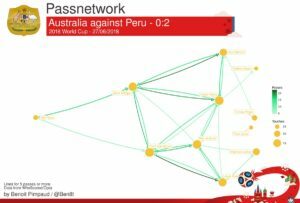 This pass map made by Ben Pimpaud shows Australia’s troubles to connect with the players up front. Despite this focus on the counter and the use of long balls, Australia still tried to build something out from the back…a clear heritage of Postecoglou’s days. Trent Sainsbury looked the main factor over there as the centre-back utilized his passing ability to connect the backline with the more advanced players. van Marwijk’s Australia tried to retain Postecoglou’s building from the back. That said, even against the weak pressure operated by Peru, Australia faced some troubles circulating the ball. With Jedinak and Moore unable to progress the ball, Australia’s possession relied on the flanks, not being good enough to go through the centre or the half-spaces despite the weak pressure made by Ricardo Gareca’s side. When it comes to the defensive part of the game, without possession, van Marwijk’s team operated in their usual 4-4-2 shape. Peru tried to play their classic, pleasant, playing style but this attempt didn’t produce any effect. 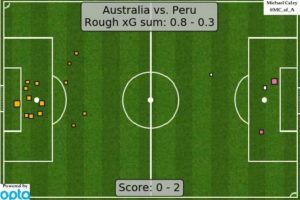 Furthermore, Peruvians struggled to face Australia’s vertical compactness, and Gareca’s team failed to create an overload in the zones where the ball was. So, van Marwijk’s side played with enough defensive security until a costly defensive allowed Paolo Guerrero to set up Andre Carrillo’s opener that made Peru scoring their first World Cup goal since Guillermo La Rosa’s goal against in 1982. Michael Caley’s xG model highlights how few scoring chances both teams produced. When Socceroos found themselves behind, they went in trouble with a rock to high to be climbed. Australia tried to answer Peru’s goal, but they were unable to reply despite a frustrated Mathew Leckie’s effort, following a Robbie Kruse’s pass. In the second half, despite the introduction of Cahill, Australia didn’t find a way past Peru while Guerrero, doubled the score, ending the game and making Peru able to successfully conclude a cynical performance. At the end, Australia presence in Russia has not been embarrassing but Socceroos once again showed they haven’t any real scoring threats, Cahill aside. The play also has been good enough defensively but lacked a bit in the opposite half of the field with only Rogic, showing something. Neither Juric nor Andrew Nabbout looked ready to play up front at this level so far. That’s not as Australia lacked identity but, under Van Marwijk, they obviously found one that differs from that they had under Postecoglou. Under the Dutchman, they favoured compactness and defensive stability over offensive football. They gave up Postecoglou’s possession football looking what they ever have been: a defensive-oriented team relying on the counter. Whether Postecoglou’s approach would have been better to face France, Denmark and Peru is difficult to say. Which style is more suitable for Australia? Maybe team’s new coach Graham Arnold will be able to answer at 2019 Asian Cup. Next articleFIFA World Cup 2018: How can Brazil beat Belgium? Italian football analyst, tactical analysis is my passion, follow me on Twitter.